Two Florida State University researchers have received grants from the National Academies of Sciences, Engineering and Medicine to study the Gulf of Mexico’s ecosystem and better understand its processes, which could help contain future oil spills. 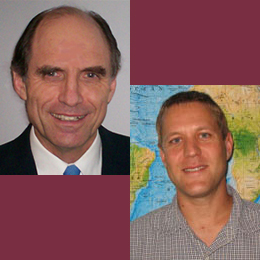 Allan Clarke, the Adrian E. Gill Professor of Oceanography, and Steven Morey, a research scientist for the FSU-based Center for Oceanic and Atmospheric Prediction Studies, have received separate awards to conduct projects that could shed light on how oil and other contaminants move throughout the Gulf. “These projects will add value to earlier investments in monitoring while improving our understanding of Gulf of Mexico ecosystems and communities,” said Evonne Tang, senior program officer for the Gulf Research Program. The proposals were selected after an external peer-review process. Clarke will receive $433,000 to develop reliable predictions of where oil floating at the top of the water column will go and how long it would take to reach the coastline. Theory suggests that the surface flow can differ considerably from the flow even half a meter beneath the sea surface. Clarke will use drift card data collected by the Gulf Integrated Spill Response Consortium during 2013 and 2014 combined with measurements of winds, waves and state-of-the-art numerical models to understand the connectivity between the deep Gulf and coastal waters. Drift cards are postcard-sized pieces of plywood that are released intothe ocean to estimate the surface flow to the coast. Morey is leading a team of other FSU scientists as well as researchers from Scripps Institution of Oceanography, Woods Hole Oceanographic Institution, the University of Rhode Island, Leidos Corporation, and the Centro de Investigaciòn Cientifica y de Educaciòn Superior de Ensenada. They will receive a grant of $897,000. Morey’s team will use a variety of historical observations with new models to better understand the currents that flow through very deep waters of the Gulf of Mexico. Despite a vast body of work on the Gulf of Mexico, there is little information on the circulation and processes that occur at depths below 1,000 meters. A more comprehensive understanding of how these deep current work could lead to better understanding of how contaminants such as oil are transported and also how this process affects the ecosystem at such great depths. Following the 2010 Deepwater Horizon oil spill, there was a pressing need to know the pathways of the released oil, but tracking that oil became exceptionally difficult and much of it seemed to disappear. The only way researchers have been able to test for oil is to guess which areas might have been impacted and then collect samples.